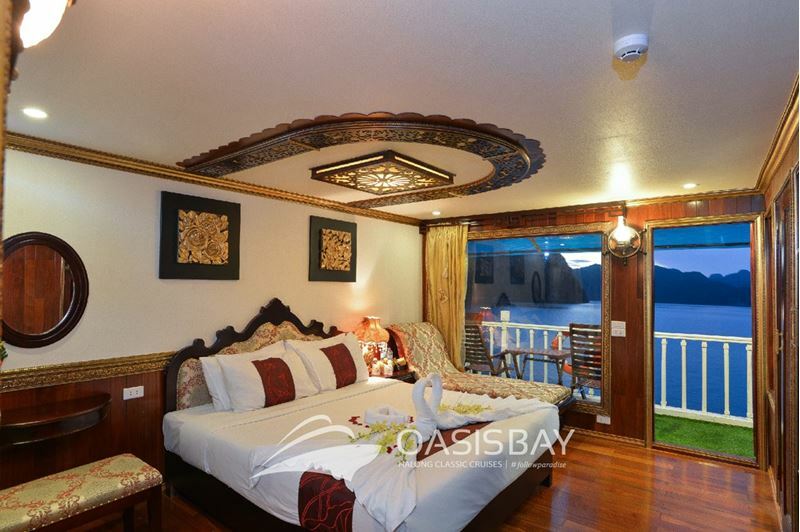 The Oasis Bay Classic Cruise is a wooden junk crewed by a professional, loyal and dedicated team with 20 dynamic, passionate and enthusiastic individuals who are committed to making your stay with us special and unforgettable. We proudly present one of the biggest wooden boats, the Oasis Bay Classic Cruise, launched in Nov 2015. The boat is fully equipped with the most advanced and upgraded technology. 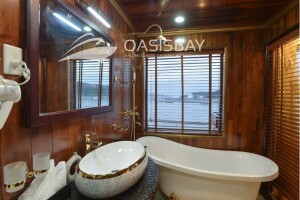 Entering the boat, you will be overwhelmed by its extreme impressive art design. 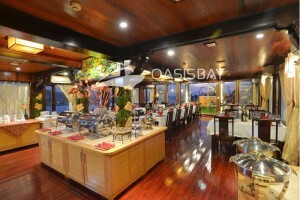 Our chef and his team are devoted to offering you some of the most reputed cuisine of the region. The selection is wide and ingredients are always local and fresh. The menu is seafood-based thus still well balanced. Vegetarian and kids can be catered for. We strive to make each meal a colorful event for both eyes and taste. 7:45 – 8:30: Pick you up at your hotel. Welcome drink, cruise briefing, safety instructions, and check-in cabins. 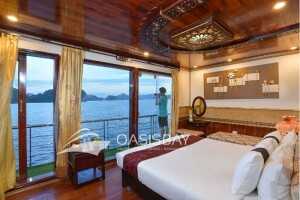 13:00 – 14:30: Special lunch will be served on board while cruising passing by Dog islet, Fighting Cockislet (symbol of Halong Bay), Hoa Cuong fishing village, Swan islet. 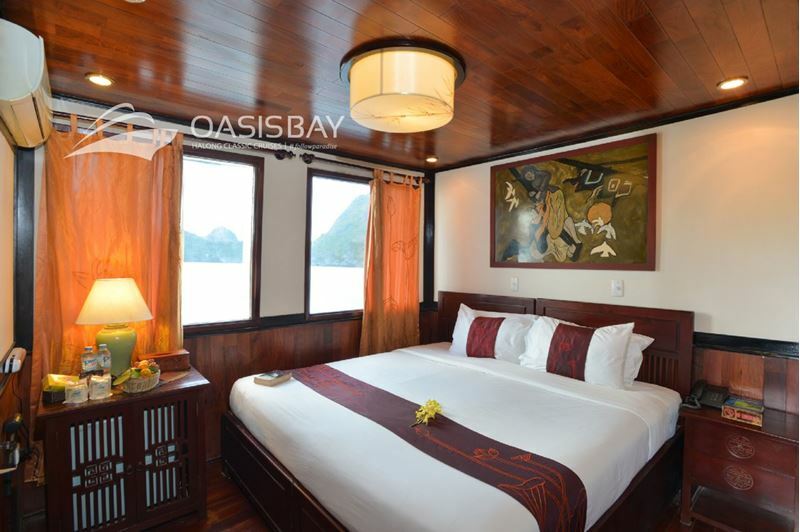 After having lunch, the Oasis Bay will continue exploring the wonders of Halong Bay, passing by countless islands including Soi Sim Beach, Coconut Tree Island. Anchoring the vessels at Frog Pond area. 15:45 – 16:45: Explore this beautiful area by kayaking through the majestic scenery and swimming in emerald coloured water. 17:15 – 18:45: Relax on the sundeck with a few cocktails complimented by a variety of tropical fruits and best local wines. 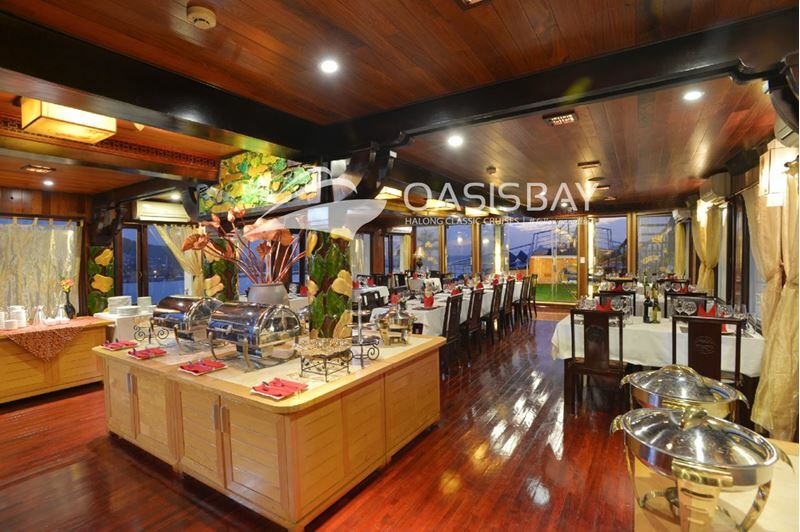 Then attend a cooking demonstration with our Chef to learn one of Vietnam’s ost popular cuisines (spring rolls) or refresh yourself in outdoor big jacuzzi. 21:00 – 23:00: Evening Activities, relax at leisure: squid fishing…. 7:30 – 8:30: Relax or Visit Sung Sot Cave, hiking up and down 600 steps to the magnificent limestone formations of the most beautiful and biggest cave in Halong bay.